Cell Biomechanics Lab -:- Home -:- Nathan J. Sniadecki Ph.D.
3.15.19 Ty Higashi has been selected as one of UW's GO-MAP fellows. His picture and profile will be up soon! 3.13.19 Our work to diagnose bleeding risk was published in Nature Communications! Check out the UW News and Reuters stories. 1.29.19 Congrats to Claire Mills for a 1st place poster award in the UW Denistry's Student Clinician Competition! 12.14.18 Robin Yan and Kenia Diaz were awarded UW Mary Gates Fellowships for Undergradate Research! 6.12.18 Prof. Sniadecki and Boeing teach the secrets of the sky! Check out the article featured on the cover of the UWME's Spring 2018 Newsletter. 3.28.18 Afterload is a mechanical cue for cardiomyocyte maturation in engineered heart tissue! Check out Andrea's paper in JMCC. 10.3.17 Microfluidic detection of hemoglobin for anemia screening! Check out Nikita's paper and the press release in AIP Advances. 9.7.17 Happy 10th Year Anniversary! The Cell Biomechanics Lab started at UW a decade ago. 8.14.17 NSF awards us a 3-year grant on magnetic sensing and actuation of engineered heart tissue. 7.1.17 Wings For Life awards us a 2-year grant with Prof. Vittoria Raffa (U. Pisa, Italy) on neuron mechanotransduction. 9.28.16 Magnetic sensing of tissue engineered heart beats! Check out Kevin's paper in Tissue Engineering Part C.
8.21.16 Cells migrate in a line like Slinky Dog! Check out Sangyoon's paper in Cell Adhesion and Migration. 8.10.16 Platelets don't need integrins to transmit force! Check out Shirin's paper in Biophys J. 12.18.15: Andrea awarded Keystone's Keystone Symposia Future of Science Fund scholarship to attend the Cardiac Development, Regeneration and Repair Meeting. 12.18.15: Check out Vodafone's piece on Thomas' lens! It was filmed in our lab! 4.10.15: Marita awarded the Whitacker International Scholar Postdoctoral Fellowship. 5.7.14: King5 did a story about our coagulation device for trauma medicine. 4.15.14: UW Today wrote an article about Thomas Larson and Micro Phone Lens. 3.9.14: Measuring the power of heart stem cells! Check out Marita's paper in J Biomechanical Engineering. 2.16.14: UW NewsBeat did a story on our coagulation device!. 2.5.14: Nikita awarded 1st Place in the Doctoral Poster Competition at NEMB 2014. 1.26.14: Shirin awarded Keystone's Travel Scholarship to attend the Thrombosis Meeting. 12.17.13: Lucas awarded the 2013 WAGS/UMI Innovation in Technology Award. 12.13.13: Shirin awarded Ron Crockett Endowed Fellowship in Mechanical Engineering for AY 2013-14. 11.18.13: Thomas wins 3rd Place at ASME's "Old Guard" Prize in San Diego. 9.18.13: Nikita awarded GAANN Fellowship. Congrats! 9.10.13: Mechanical feedback in the heart! Check out Anthony and Marita's paper in Integrative Biology. 9.5.13: Five commercialization organization partner together to award Prof. Sniadecki grant for trauma-induced coagulopathy. 9.1.13: The Scientist has an article highlighting our work on endothelial mechanotransduction. 8.21.13: Spin-out! Check out Thomas Larson's Kickstarter project for a cell phone based microscope. 6.23.13: Congrats! Lucas and Shirin *each* win 1st place for their talks at ASME SBC 2013. 6.18.13: Prof. Sniadecki awarded the Albert Kobayashi Professorship. 6.13.13: Samantha awarded the Henry T. Schatz Endowed Scholarship and Russell Gibson Wayland Scholarship for 2013. 5.20.13: Shirin wins NIH BCTG Traineeship. 4.20.13: Thomas wins 1st Place for Best Technical Presentation at Pacific District D of ASME. Next up, Nationals in San Diego! 4.10.13: Thomas wins 1st Place for Student Presentation Competition at Western Washington section of ASME. 2.12.13: Lucas wins 'Outstanding Paper Award' for his talk at NEMB. 2.5.13: Congrats! Samantha awarded Morrison Scholarship from UW's ME Department..
1.18.13: Thomas wins 3rd place at UW SEBA's Science and Technology Showcase. 12.14.12: LSDF awards Prof. Sniadecki grant to build a Platelet-Dx prototype. 8.27.12: Untangling stiffness versus spreading versus micropost density! Check out Sangyoon's paper in Biophys J. 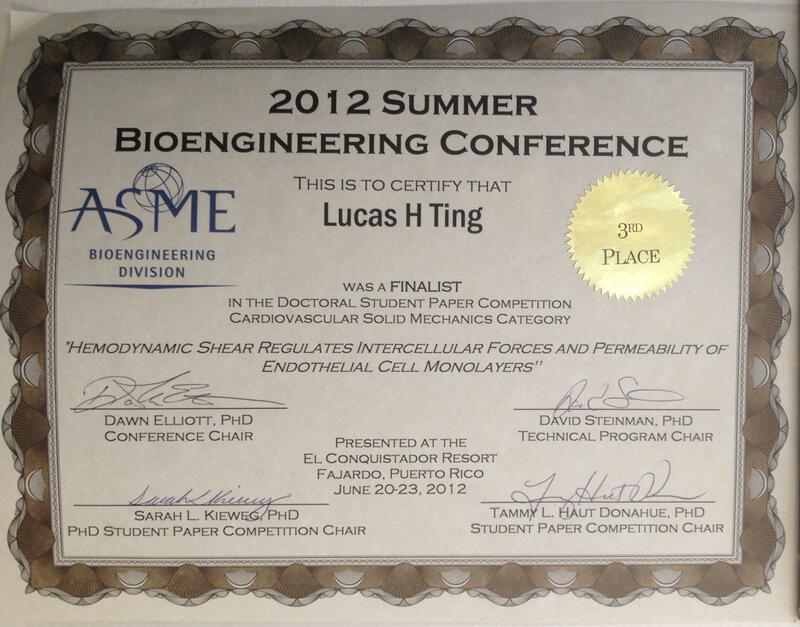 6.23.12: Lucas wins 3rd place for his talk at ASME SBC 2012. 6.16.12: Lucas wins 1st place for his talk at UW Radiology's Imaging Sciences Research Day. 5.22.12: Sangyoon defended his PhD dissertation. Congrats, Dr. Han! 5.15.12: Thomas and Rhiannon win NASA SURP fellowships! 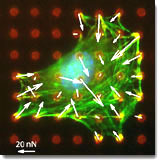 4.3.12: Cells pull together tightly under flow! Check out Lucas' paper on endothelial mechanobiology in AJP-Heart. 4.1.12: Congrats to Kevin for his Honorable Mention from the NSF Graduate Research Fellowship Program. 12.14.11: Albert Folch used our image for the cover of his new book. 11.23.11: The power of a hardened heart! Check out Anthony's new paper in Biophys J. 10.28.11: Sangyoon was awarded a Travel Fellowship to attend ASME's Society-Wide Micro/Nano Technology Poster Forum. 6.25.11: Shirin wins 1st place for her poster at SBC 2011. 6.6.11: Lucas wins 2nd place for his talk at NWBS 2011. 5.17.11: Marita was awarded a Travel Fellowship to attend the 3rd USNCB Symposium on Frontiers in Biomechanics: Mechanics of Development. 5.13.11: Prof. Sniadecki has been selected for DARPA's Young Faculty Award. 5.6.11: Sangyoon's paper on modeling cell migration appeared in the special issue of CMBBE on computational modeling in cell mechanics. 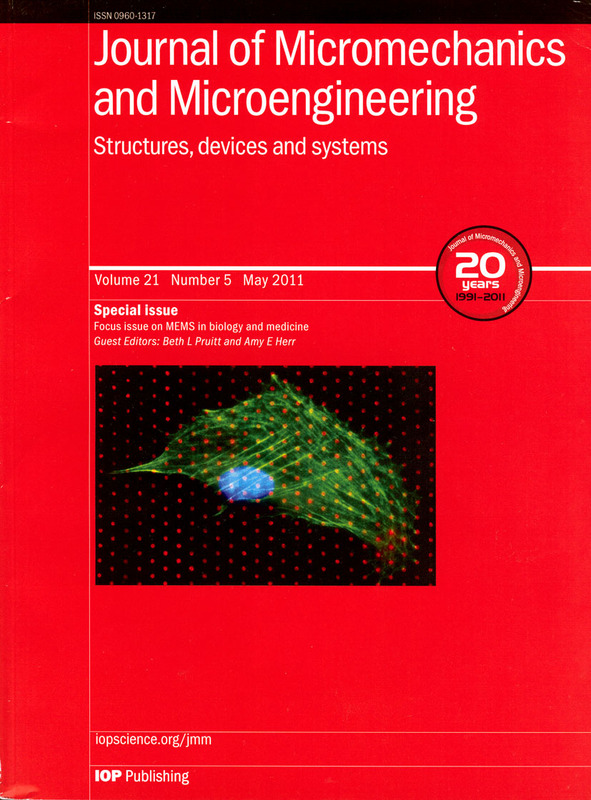 4.28.11: Wes' paper was selected for the cover page of the special issue on 'MEMS in Biology and Medicine' in J Micromech Microeng. 4.5.11: Marita was awarded NSF Graduate Fellowship! 8.31.10: Lucas wins NIH BCTG Traineeship. 4.1.10: Our platelet paper was selected for the cover of Lab on a Chip. 3.12.09: Ben wins 1st Place for Student Research at Seattle Chapter ASME. 1.07.09: Sangyoon award Kobayashi Fellowship for AY2008-09. 10.31.08: NSF has given Prof. Sniadecki the Faculty Early Career Development (CAREER) award. 09.07.07: Prof. Sniadecki joined the ME department. Our mission is to understand how mechanics affects human biology and disease at the fundamental level of biological cells. Factors such as force, adhesivity, organization, and material properties, can influence the structure-function relationship in tissue. This occurs naturally through a process known as mechanotransduction, which is the conversion of mechanical factors into biochemical changes, and can influence cellular functions such as proliferation, differentiation, migration, and apoptosis. However, it is difficult to identify the effect of mechanical factors because we lack appropriate tool-sets with which to study mechanobiology. In the Cell Biomechanics Lab, we address these questions with new experimental techniques and modeling approaches in order to build up a knowledge base on cell mechanics. If we can understand how cells are guided by mechanics, then we can alter or direct cellular properties and responses in order to influence large changes in tissue and organs. Moreover, these properties and responses can serve as mechanical signatures that allow us to diagnose diseased states in our cells and tissues. We specialize in the design and development of new micro- and nano-tools for biological and medical research. We manufacture these tools using microfabrication and innovative processes in nanoscience and bioengineering. By miniaturizing the tool, we can probe the role of cell mechanics at the length scale appropriate to the size of cells and their proteins. Our bodies can be viewed as a hierarchical system where our organs are composed of different tissues, which are defined by cells and the properties of the proteins they express. A key aspect to our physiology is how all the small parts come together, e.g. cytoskeleton, focal adhesions, cell-cell contacts, cell membrane, etc. Through studying the coordinated activity of cells and quantifying their mechanical properties, we can understand normal and diseased physiology at a fundamental level.